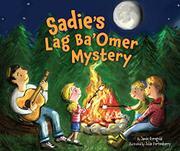 Kirkus Review for SADIE'S LAG BA'OMER MYSTERY! One full moon in spring heralds a Jewish holiday that is not familiar to the savvy Sadie but has its own reason for celebration. At school, Sadie learned that Jewish holidays often begin with a full moon. What spring holiday is forthcoming after Purim and Passover? Curious, Sadie reads the calendar and learns it is something called Lag Ba’Omer. What’s that all about? She explores the house with her little sister and finds only items related to Rosh Hashanah, Simhat Torah, Hanukkah, Passover and Shabbat. Stumped, she begins to question everyone, including family members and the parcel delivery man (who must know all about holidays). Her grandfather finally tells her that this new holiday is not about presents, might involve picnics, songs and campfires, and of course includes delicious food. She’s still mystified, so he tells a story about an ancient rabbi who was forbidden by the Romans to teach and study Torah and so did it secretly in a cave. Lag Ba’Omer is a day dedicated to his steadfast bravery. It is remembered with picnics, bonfires, singing and storytelling and usually celebrated between the holidays of Passover and Shavuot. The evenly told story is laced with mild suspense. It is coupled with cheery illustrations that include carefully placed details that indicate the centrality of faith to this suburban family.